Application Fee: For General/OBC candidates are required to pay a sum of Rs. 700/- + Intimation charges of Rs. 300/- and For SC/ST/Women/ PH/ Ex-Servicemen candidates: Rs. 300/- as exam fee. 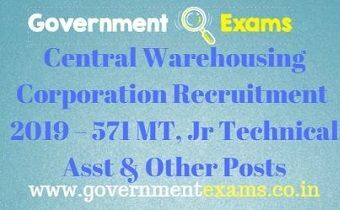 Click here to view official notification: Central Warehousing Corporation Recruitment 2019 official notification. Click here for online Registration: Central Warehousing Corporation Recruitment 2019 online Registration.